The LG G Watch and Samsung Gear Live - both featuring rectangular screens - mark an attempt to standardise the way Android wearable devices function. Google said that Motorola's circular Moto 360 would not be released until "later this summer". 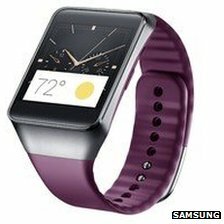 "The problem with smartwatches so far has been that the sector hasn't quite decided what it wants to be - is it a phone on your wrist or an accessory device," Steffen Sorrell, from the Juniper Research consultancy, told the BBC. "Once you introduce Android Wear, it will hopefully provide a more focused case for what the devices are capable of. And that's a direction that could invigorate the market." LG said the G Watch costs $229/£159 and would initially be made available to 12 countries including the US, UK, France, Germany and Japan. It is due to ship on 4 July. Samsung said the Gear Live would cost $199/£169 and ship on 7 July. Both will require the owner to have a phone running Android 4.3 or above. 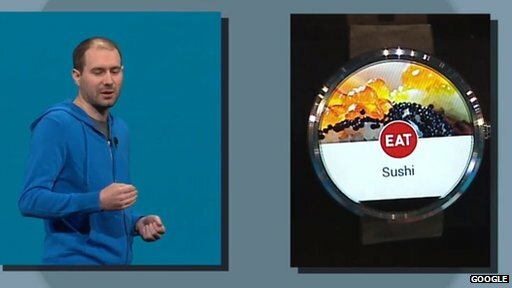 Google dedicated an early part of its I/O developer conference presentation in San Francisco to its new wearable OS. David Singleton, director of engineering in the firm's Android division, said one of its core aims was to be able to "quickly show you relevant information, and make sure you never miss an important message, while letting you stay engaged with the people that you are actually with". To achieve this, when notifications are received by the user's smartphone they can be set to make the watch vibrate on the user's wrist. If the owner then dismisses the alert and carries out a follow-up action on the watch, such as scheduling an appointment, the details are "immediately synched across" so that the smartphone also hides the notification and adds the meeting to its diary. Users can also reject calls to their phone via the watch and select a pre-set text message to explain why, and bring up map navigation. 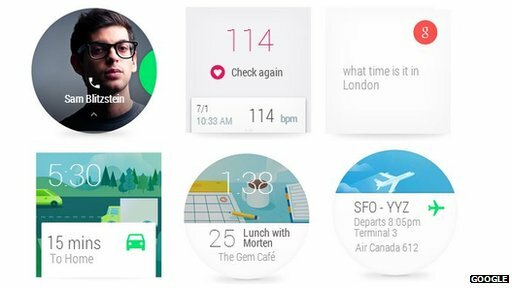 Much of Android Wear's user interface (UI) relies on the firm's Google Now card-based system. It allows owners to swipe up and down to different types of information, and left and right to find out more about a specific topic. 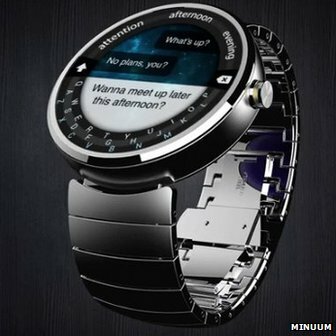 However, Mr Singleton's demonstrations at the event suggested that his firm expects consumers to carry out many of the watch controls by voice command. Saying "OK Google" prepares the device to take an instruction - similar to the way its Glass eyewear functions. Example tasks shown on stage included setting reminders, taking notes, setting an alarm and playing music. Mr Singleton also highlighted that many of the OS's functions would be triggered by "context", without requiring a human action. He showed how flight information could be flagged on the day of travel, a restaurant reservation close to the time of the booking, and local bus timetables when travelling abroad. He added that this functionality was also being made available to third-party developers, giving the example of a place being highlighted when the owner approached if it had been "pinned" by a friend on the Pinterest social network. Other examples of third-party software included an app that makes it possible to order fast food, and one that allows owners to hail a taxi - both designed to involve few button presses. The watch does not have access to a special store to download such apps, but instead automatically gets them when the handset version is downloaded to a paired phone. Android Wear presents an opportunity for Google to become the provider of the "go-to" platform for smartwatches, stealing a march on Apple. Until now, smartwatches have not been terribly "smart", in part because of a lack of decent apps. 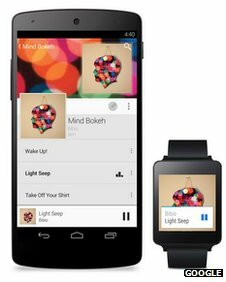 Making the mobile version of Android easily tweakable by developers to run on your wrist should deliver a huge variety, especially if they can bring a deep integration with your handset. But much will depend on execution; and for many use-cases, the case has yet to be made for a 2in (5cm) screen to effectively replace the 5in one in your jeans pocket. 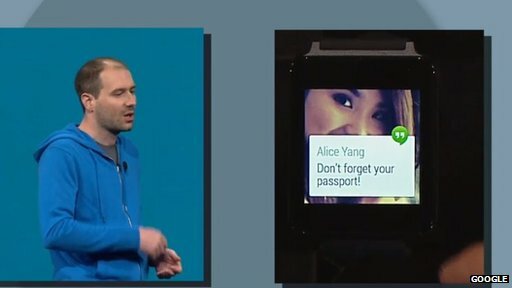 One industry watcher who has tested a prototype Android Wear device said he expected it to now become the de facto standard for wearable kit with screens. "What Google is trying to achieve here is a glanceable UI and that's the key to wearables," said Ben Wood, from the CCS Insight tech consultancy. "Android Wear is not a full operating system, it's merely a smartphone companion, and my view is that's the right starting point for Google at a time when everyone is feeling their way in the dark and trying to find a compelling case for what to do with it beyond the basic stuff. "I think all the other proprietary efforts with [Samsung's use of] Tizen and other proprietary software will now be pushed to one side because of the public awareness Android Wear will generate, how it will become the focus for developers and the fact that people will have the guarantee that they can use one brand of Android Wear watch with another brand of phone." He added, however, that the voice commands might prove problematic in crowded, noisy environments, noting thatthird-party developers including Minuum were already working on Android Wear keyboards to address the issue.